The Zhuang ethnic minority have their own indigenous religion known as Moism or Shigongism, which is an animist faith based on their prehistoric beliefs. The polytheistic nature of the religion means they worship many things, from giant rocks and old trees through to dragons and birds, although the main focus is on ancestor worship. And, when it comes to Moism, three is the magic number! They believe that the universe is tripartite, with all things being composed of three elements; heaven, earth, and water. People are believed to have three souls after they have died; one that goes to Heaven, one that goes to the cemetery, and one that comes back to protect the deceased’s family. A complete family is seen to have three parts: the descendants, the clan graveyard, and the spirits of the ancestors. 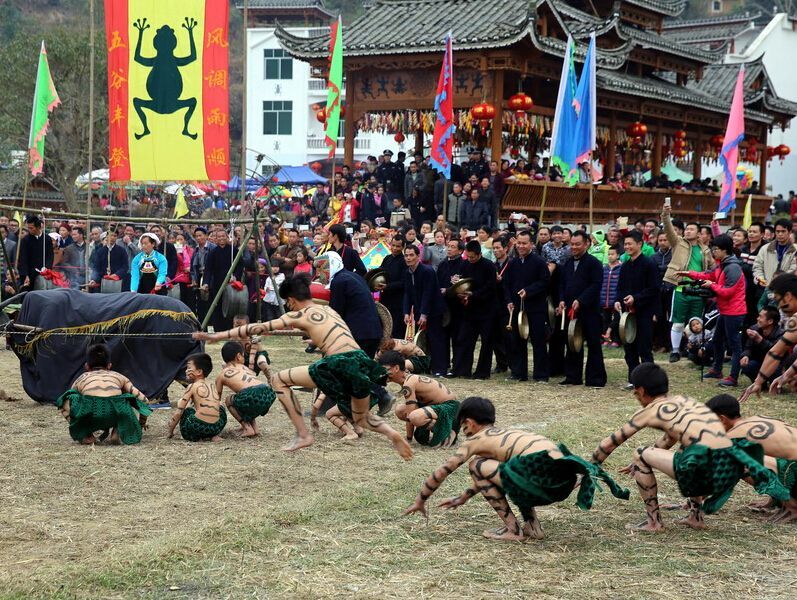 With all these ancestral spirits flying around, three is never a crowd for the Zhuang! Furthermore, this means that the souls of the dead can enter the netherworld but can continue to assist the living. 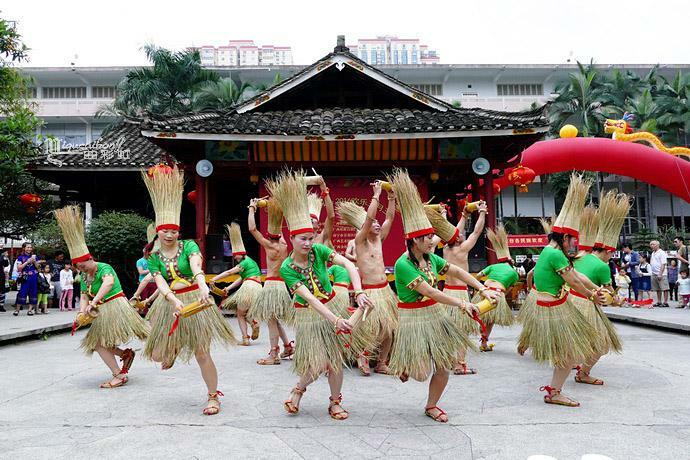 The ancestral spirits are believed to protect the family but also have the capacity to punish them, so most Zhuang families will have an ancestral shrine at the centre of their home where they can worship their ancestors as well as other deities. Buluotuo, the God of Morality, is one of their shared ancestors and is believed to have created the world, as well as being responsible for the establishment of moral order. In the Zhuang language, “bu” is the epithet for honoured elders, “luo” means “to know a lot”, and “tuo” means “to create many things”. He is married to a goddess known as Huapo or the Flower Mother, although some Zhuang communities believe that she is his mother. At least no one thinks she’s both! She was born out of a flower at the beginning of the world and is the Goddess of Reproduction. She is usually depicted guarding a large garden full of golden and silver flowers, with the golden flowers representing boys and the silver ones representing girls. Upstanding moral villagers will be rewarded with good flowers (i.e. good children), while those who are immoral will receive withered flowers (i.e. bad children). When a baby is born, a plaque in Huapo’s honour and a bunch of wildflowers will be placed near the baby’s bed. If the baby becomes sick, the mother will offer gifts to Huapo and water the wildflowers. The goddess’ birthday takes place on February 29th according to the peasants’ almanac and on this date women will pick flowers and pray to her for conception. The Zhuang epic Baeu Rodo is a poem about how Buluotuo created the world. It is a staggering 10,000 lines long and over 1,000 years old! Originally it was passed down orally but was transcribed sometime during the Ming Dynasty (1368-1644). The epic is split into four sections, all of which can be read independently. The first is an introduction; the second is about the creation of the world; the third is about the creation of leaders; and the fourth is about the establishment of morals and ethics. The Zhuang people will often sing it at worshipping ceremonies and it is widely regarded as a religious text. Other deities in the Zhuang canon have been borrowed or adapted from Han Chinese folklore. These include Tudigong, who protects the village boundaries; She Shen, who protects the village itself; the Mountain Spirit, who resides on a sacred mountain that is not to be farmed; the Dragon King, who protects the village during natural disasters; the Land God, who controls drought, flood, pestilence and disease; and a number of other spirits, such as the Kitchen God, the Water God, the Rice God, and the Sun God. In fact, there’s pretty much a god for everything! They sacrifice to these deities on a regular basis as they believe this will protect their livestock, their crops, and their families. There are two types of religious figure in Moism: female diviners and male shaman or necromancers. The female diviners treat the sick and can communicate with the spirit world when in a trance. They have no teachers or students, nor do they read from any scriptures or religious texts. They are normally asked by families to contact the spirit world and pass on messages to deceased relatives. They also contact spirits or even deities to inquire about the future, particularly with relevance to fortunes and disasters. While they are divining, they will use a special ladle called a “ding” as a musical instrument and may also shake small bells. The male shaman or necromancers serve at an altar and are able to read and write Sawndip, the Zhuang’s writing system. Thus they are the only members of the community that can read certain texts, which usually relate to mythology, history, geography, and astronomy. They are sometimes called great masters and can take on students. Their primary function is to dispel ghosts, pray to spirits, help people choose an auspicious time or place to do something important, and tell people’s fortunes. They are often employed to perform at funerals, local festivals, and in times of crisis. Sometimes a Taoist priest will take the place of a shaman, although he will chant in Chinese instead of the Zhuang language. Buddhism in Zhuang communities has been heavily influenced both by Taoism and Moism, so Buddhist priests are allowed to marry and are only semi-vegetarian. Their main function is to write horoscopes, act as geomancers, and exorcise ghosts, although they will also help in times of crisis by chanting sutras. In other words, when it comes to religion the Zhuang have all their bases covered! Animism: The belief that all non-human entities, including animals, plants, and even inanimate objects, possess a spiritual essence or soul.